Plastic six-pack rings are the bane of conservationists, entangling and killing sea life. But a Florida-based brewery has come up with an environmental alternative. 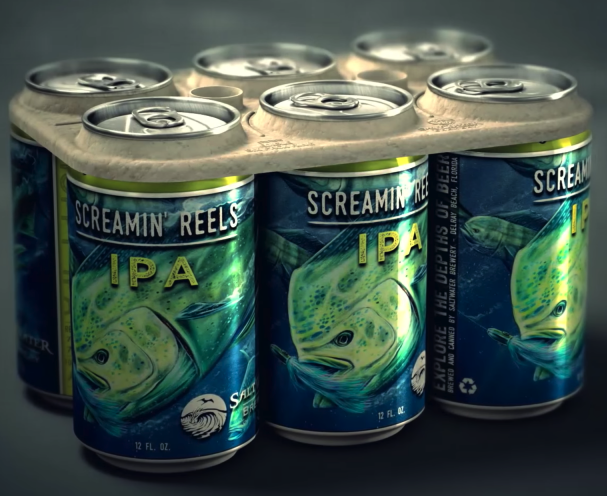 Saltwater Brewery has partnered with the ad agency We Believers to create what they say is the first fully edible beer can packaging. Made from byproducts of the brewing process such as wheat and barley, their six-pack holders, which are just as strong as the plastic variety, are fully biodegradable and completely digestible. Rather than ensnaring wildlife, the six-pack rings could serve as a satisfying snack. And if nothing bites, it will quickly decompose. The company 3-D printed a test batch of 500 holders in April and now plans to scale up production to meet its current output of 400,000 cans per month. While the edible holders are more expensive to make, Saltwater Brewery wants this to set an example for other beer producers and encourage them to adopt the idea. They say if their edible holders become commonplace, they could potentially be as cheap as the regular plastic rings. Moving away from plastic entirely and embracing sustainable solutions would be a much better idea. It’s not just drink holders that threaten wildlife - plastic of every size and description floats in the oceans. The Ocean Conservancy’s 2015 investigation found plastic inside many species of marine animals.